A "breathtakingly beautiful" £20m extension to Cornwall's Tate St Ives gallery has earned it the prestigious award for Museum of the Year. The venue reopened in October after an expansion that doubled its gallery space by digging into the cliff face. That impressed the judges of the Art Fund's annual Museum of the Year award, which comes with a £100,000 prize. Art Fund director Stephen Deuchar said the extension was "deeply intelligent and breathtakingly beautiful". Mr Deuchar, who chaired the judging panel, also said the redevelopment provided "the perfect stage for a curatorial programme that is at once adventurous, inclusive and provocative". Tate St Ives opened in 1993 to celebrate the artists who were attracted by the light in the coastal town from the 1930s onwards, including Barbara Hepworth, Ben Nicholson, Alfred Wallis and Patrick Heron. The gallery proved more popular than expected, and plans for an extension were drawn up 15 years ago. Many locals objected to the original proposals, however, with more than 2,000 signing a petition, saying the scheme would block views of the sea and take up car parking space. So architects decided to dig into the cliff face instead, and the venue was shut for 18 months while the work was carried out. Last year's prize was won by another place with links to Barbara Hepworth - the Hepworth Wakefield gallery in the West Yorkshire city where the sculptor was born. 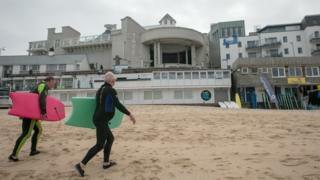 Simon Wallis, director of Hepworth Wakefield, welcomed Tate St Ives' win. But the news was not universally welcomed, with art critic Waldemar Januszczak saying it was a win for "southern privilege". Rosie Millard, the former chair of Hull City of Culture 2017, said she had wanted Hull's Ferens Art Gallery to win from the shortlist, saying: "Not one member of the jury from the north. Zero." Dr Gabrielle Heffernan, the curatorial manager at Carlisle's Tullie House Museum and Art Gallery, added she was keen to see a museum - rather than an art gallery - win the coveted award. The Hepworth Wakefield has just announced that it will use its £100,000 prize money to buy a sculpture by Turner Prize and Hepworth Prize winner Helen Martens, and to help transform neighbouring land into a new public garden.